Congratulations to Vincent on this prestigious win! Please turn to page 96 for more details. Innovation seems to form an integral part of human history. There has always been an underlying urge, even a sense of romance, to innovate at whichever point in time. Regardless of how innovation can really be defined and thus brought about, society embraces the idea of innovation, as it characterises growth and achievement, both of which evoke deep emotional significance in all of humanity. Despite the pure and inspirational implications of the idea, innovation has perhaps also become an all too convenient go-to buzzword in this day and age. We hear it being thrown around in all facets of society these days, expressing the favour towards so-called innovation and creative thinking. This is certainly not a bad thing, and indeed it poses a very apt avenue of pursuit. However, as with all buzzwords, there are some inherent difficulties that may ensue as a result of its use as such. Buzzwords, or even buzz-phrases, appear to have the intension of expressing some higher-order meaning, which seemingly is of great significance to a particular audience. I am, however, quite doubtful that this is ever the case. Buzzwords are popular, as implied by its inherent definition, but its popularity may just be the essence of the problem. My issue with a buzzword is that it doesn’t seem to ever follow a critical path of reasoning in its inception. Its popularity appears empty, as it has never undergone the stark logical critique which classical principles and ideas had endured in order to reach the same level of popularity. It is seldom that a buzzword triumphs through baptism of logical assessment, and it typically does not stand the test of time. Nonetheless, buzzwords creep into our speech somehow and linger in our language for a while, without first redeeming itself the place it deserves. On first thought, this is hardly a problem, but the qualm about this is that language influences our perceptions. In turn, our perceptions influence our decisions, and our decisions influence our behaviours and cultures. The seemingly trivial buzzwords we use in daily colloquial language may have larger secondary and tertiary effects down the line. Those of us who have been involved in enterprise, even to the least extent, would probably empathise. We have heard words to the likes of “greening”, “benchmarking”, “touch base”, “cognisance”, “empowerment”, “blue sky thinking” etc … or fancy phrases such as “collaborative cultivation of next-generation communities”, “assertively enabled ethical systems”, “interactive building of core-global competencies” … and I could go on with buzz-phrases to that effect, some more sensational than others. Therein lies the high cost of cheap buzzwords – the opportunity cost of permitting language to set engineering leaders and managers down irrelevant paths – asking the wrong questions, putting the right shoes in the wrong boxes, or failing to see that the problem on the table isn’t the problem at all. This trend seems to be evident not only in enterprise, but also (and probably more so) in politics and with decision-makers of a more bureaucratic conviction. Now before I make so-called “buzzwords” sound like a disease, I must concede I may have indulged in a bit of exaggeration to prove the point. The point here is that we often use words we don’t fully understand to describe entities that we perceive to be of value, for some presumed party that we are unable to empathise with. Why do we do this? Perhaps it’s attributed to some part of our social insecurity and our hopes that buzzwords would bring us some sense of belonging. Perhaps it’s just an innate tendency to mimic those around us. Perhaps it’s that same part of us that gives in to the sway of a master rhetoric, the part that so desperately wants inspiration, but at the cost of the pragmatic engineering cynicism we possess. As young practitioners, and given our especially hot-blooded naivety, we are highly susceptible to riding the hype and the buzz. The problem with jumping on buzzwords just because they are popular is that it conceals a bigger problem in the subject matter in which it is founded. We need to be cautious that we do not excessively exploit buzzwords and partake in hype. The same goes for all so-called “hot” topics that are rampant in our industry today. Let us bring the analogy back to our aforementioned ideal of “innovation” – presumably our knight in shining armour that is to launch us into the future, revolutionising the African Renaissance. Breaking the golden image down, I’d like to invite our readers to critically think about what innovation is and what it means to innovate, and perhaps more fundamentally, what the value is that it creates, and at what cost. We should be careful that our drive for innovation is not just some mere promotional word, but more of a blueprint that is technically justifiable and worthy of adoption. This implies that there needs to be explicit and measurable outcomes of innovation diffusion. The significance of change also needs to be realised. Once again, this needs to be done beyond the bounds of “change” as a buzzword. It’s very common to hear people say “change is good”, “change is inevitable” or “change is the only constant”, but do we really understand the implications of change and innovation, and whether that can be aligned with the current problems we face? Bringing about innovation is complex, especially within the presumably conservative construction industry. Innovation cannot occur without some extent of change and, likewise, change naturally should only be justifiable through the forecast of some beneficial outcome – in this case the benefits that come with innovation. This also implies that in order to drive innovation, we succumb to all the challenges that are associated with change. Despite the embrace of innovation as a principle, we know that our industry is typically very resistant to change, be it on the level of processes and tools, but perhaps more so in terms of mentality. Change can be equated to simply becoming different, and this is a necessity in enabling the long-term survival of organisations through the ages. However, change and innovation may well be at the cost of short-term efficiency, which on the other hand ensures the immediate profitability of organisations. The big challenge now is contemplating how one should handle this balancing act between efficiency, providing short-term stability, and the revered innovation required for the long-term survival organisations in this ever-changing world. This highlights the question whether one is able to, as an agent of change, decide strategically on where the optimal point of balance is. Admittedly there are demanding details to contemplate. Still, the excessive pitch of “innovation” and “change” as buzzwords shrouds the clarity of these very details. In the broad perspective, I think the civil engineering industry is typically very good at getting better, but somehow poor at getting different. Ironically, one would ever so often hear bright-eyed young engineering graduates motivate their vision with “making a difference” in the industry. We cannot help but wonder what happened with this creative zest only a few years into the career. Nevertheless, I’m very inspired still to see the push towards innovative solutions and the embrace of change, at least in principle. Now that the drive is there, real progress needs to be realised. We need to start thinking and asking the right questions, pondering the right dilemmas to enable the realisation of logical plans and feasible models. So, let us not get too caught up with words, or obsess over the unjustifiably conjured hypes in society and the media. Let us not regard the pursuit of innovation as a Buzz; instead we need to ponder deeply and cautiously about innovation as an implementable engineering Blueprint. 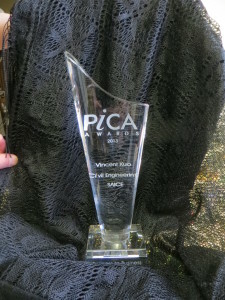 SAICE fares well at PiCA 2013! This year SAICE again entered its magazine, Civil Engineering, for the annual PiCA Awards, which are considered the “Oscars” of the South African magazine publishing industry. We are delighted to report that we received awards in both of the categories that we had entered. Individual articles are entered, and the category is open to all fields, i.e. engineers, lawyers, fashion designers, etc. Two awards were made in this category, both to authors of articles that had appeared in Civil Engineering. Winner: SAICE young member Vincent Kuo for his article “The Art of Civil Engineering” (p 14 July 2012). The judges commented that Vincent’s article was a fresh, provocative and elegantly written take on the meaning of art in a world run by engineers. Please turn to page 94 to see Vincent and his PiCA trophy. Vincent, please accept our heartiest congratulations on this wonderful win! Highly Commended: The 2012 BERRT group comprising, among others, SAICE members Johannes Haarhoff, Francis Legge and Johan de Koker for their article “Cry the beloved railway” (p 40 May 2013). Congratulations to Johannes and his team! And thanks again for an attractive and very interesting article. In this category two editions of our magazine had to be submitted. Two awards were made – a winner (Earthworks) and a Highly Commended for our magazine, Civil Engineering. The awards were made at a glittering gala event, held in Johannesburg in mid-November, where the cream of South African magazines were showcased in three different publishing sectors – Consumer, Customer and Business-to-Business (SAICE’s magazine falls in the Business-to-Business sector). It was obvious from the showcased winners that the standard was high and the competition stiff. So, congratulations and thanks to all our members who so regularly submit articles. It is your top-class contributions that make it possible for your magazine to compete with the best!